Off-the-charts power. PowerIQ technology. Five ports. Charging re-created for our multi-device world. 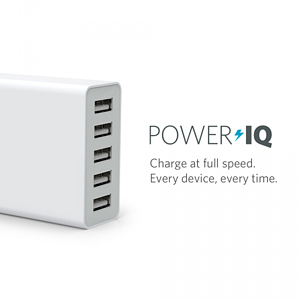 PowerIQ™: Charge at Full Speed. Every Device, Every Time. 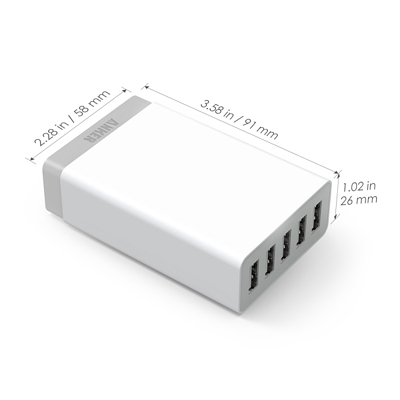 With 10,000mAh of capacity, charge your iPhone 5 / 4 / 3GS / 3 four to five times (40 hours of Not all charging ports are created equal. 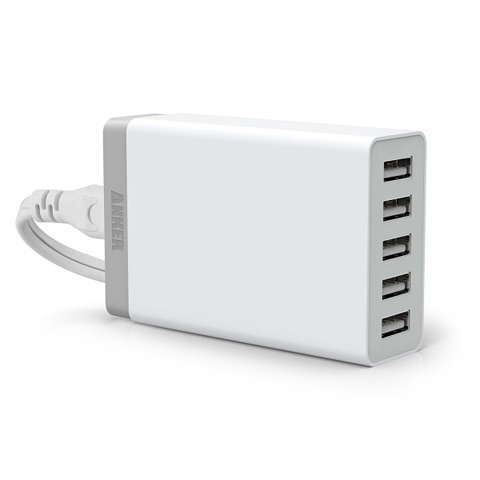 Standard ports only charge Apple OR Android devices at full speed. Our solution? Smart ports, powered by PowerIQ™ technology, intelligently identify your device and speak the language it needs for full speed charging. Say goodbye to using multiple adapters & outlets. Say hello to all-in-one charging convenience. 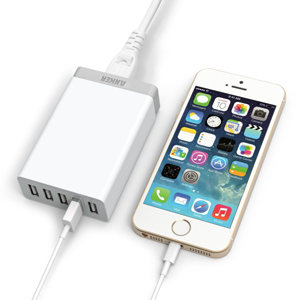 With an industry-high 40W power output among 5 ports, charge any combination of phones, tablets or other USB-charged devices at full speed (up to 8A). 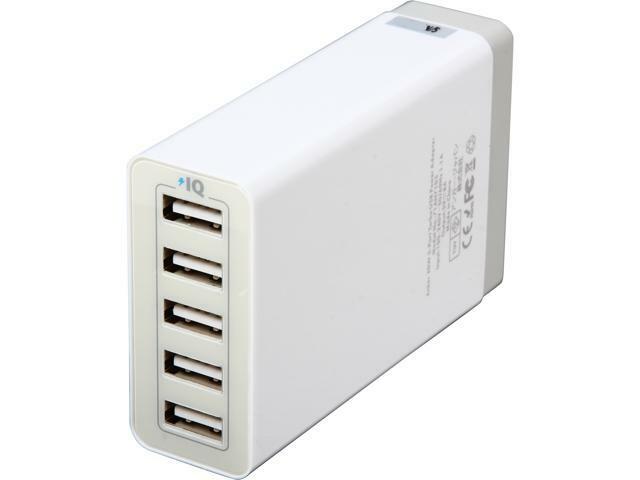 Even charge a trove of 5 power-hungry tablets all at once. About the size of a deck of playing cards (3.6 x 2.3 x 1.0in. ), place on your workstation, nightstand, or even the entryway desk - creating the perfect charging hub for your gear or the family's. Or, take it traveling - the unibody construction withstands bumping when stowed in your bag. Using top-grade microchips and built-in fail-safes, we can ensure you receive full power and also full safety. We incorporated a unique port-level circuit protection system that shuts it down in the event of overvoltage, overcurrent, overheating or short circuits. To ensure complete safety and best performance, we strongly recommend using your device's original cable or a third-party certified cable (such as MFI). 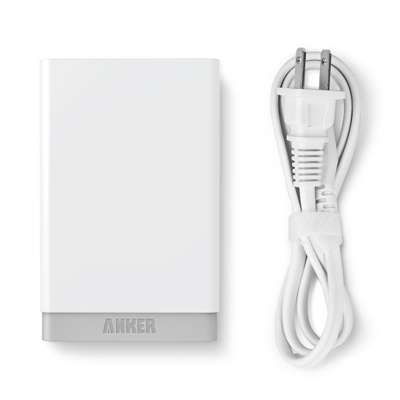 Compatible with ALL phones, tablets and other USB-charged devices. Off-the-charts power. PowerIQ technology. 5 ports. Charging re-created for our multi-device world. PowerIQ: Charge at full speed. Every device, every time. Not all charging ports are created equal. 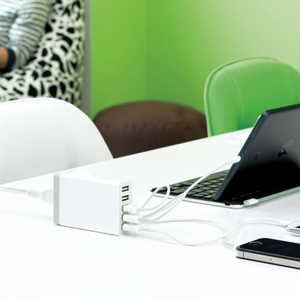 Standard ports only charge Apple OR Android devices at full speed. Our solution? Smart ports, powered by PowerIQ technology, intelligently identify your device and speak the language it needs for full speed charging. 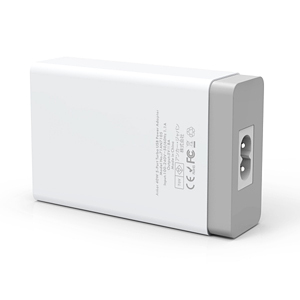 About the size of a deck of playing cards (3.6 x 2.3 x 1.0in), place on your workstation, nightstand, or even the entryway desk - creating the perfect charging hub for your gear or the family's.Or, take it traveling; the unibody construction withstands bumping when stowed in your bag. Pros: This would be great if it lasted. Cons: Very soon after purchase one of the 5 ports stopped working. Oh well I don't need all five. Then a few months later another stops working. Now about 2 years later only one works. I feel like a product of this type should last longer. Cons: I usually just charge my iPhone overnight and don't pay attention to the charging rate, but I'm realizing it's actually much slower than advertised. I actually measured charging rates last month and it's 30% slower than my 99 cent car charger. The same is true when charging other devices as well. Pros: I bought this to see if I could eliminate all the extra charges and still use the fast charging features of our new phones and ipads and it works flawlessly! I have tried fast charging 3 devices and regular charging 2 older devices at the same time and it works great! It cuts down on the needed outlets, no more power strip, just a single outlet for this device! Pros: Although the product failed and it was just outside one year and not eligible for Newegg return, Anker Customer Service came through. Sent out a new one after verifying purchase on their 18 month warranty. They were great to deal with. Cons: None with Anker Customer Service. Pros: Small and worked for about a year. Then the ports started to fail and now, only one port actually works. Cons: Ports started to die off after about 7 months. Should have returned it then but waited too long and now it's just outside the year warranty. Should have believed the other reviews. Now, only one port works. Pros: Never properly charge any of my devices (I have 6), and finally it died in 5 month. Cons: Don't buy this device, waist of money.